Christmas in Slovakia just wouldn’t be the same without a table full of many kinds of beautifully decorated Christmas cookies. 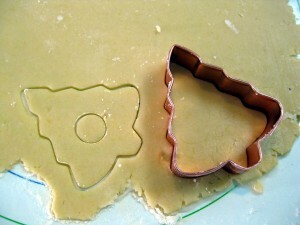 Baking of Christmas cookies starts a week or even two before the holiday. Each day, one or two kinds are made, and by the time Christmas Eve comes knocking on the door, the plate is full of various shapes, colors, and tastes. Just like shown on the left. 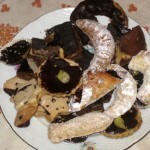 Those are Christmas cookies baked by my grandma for the last year’s holiday. I have already shown you how to make two popular kinds, vanilla rolls (or bear paws) and rum balls. But since my mom is back in the States, I figured I should learn how to make few other kinds. We baked them this past Sunday. 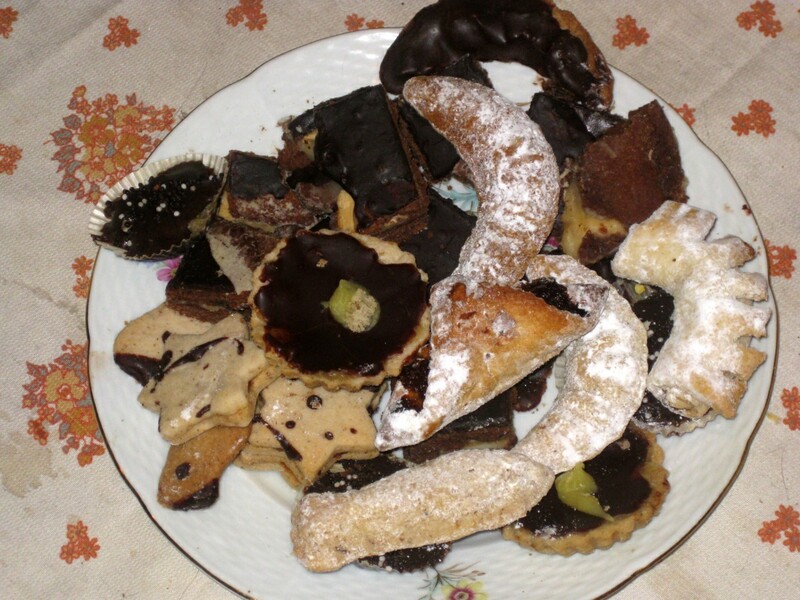 In all, we ended up making 3 different kinds (plus few other Slovak specialties). It’s hard work! We started before lunch, and were not finished until after dinner time. Here is part 1, for little hearts, srdiečka. This particular recipe comes from “Vianočné Recepty” (Christmas recipes) inset that came with a magazine Chvíľka pre Teba (a moment for you). These hearts are type of baked goods called krehké pečivo, which translates as fragile baked goods. If I am not mistaken, the term in English is shortbread cookies. 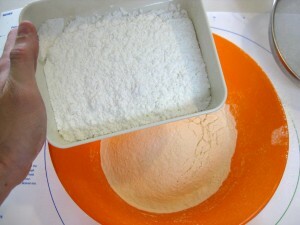 The dough is made by mixing flour with butter (or margarine) without adding any water. The result is a crumbly texture that is dense, unlike the airy and puffy texture of pastry. 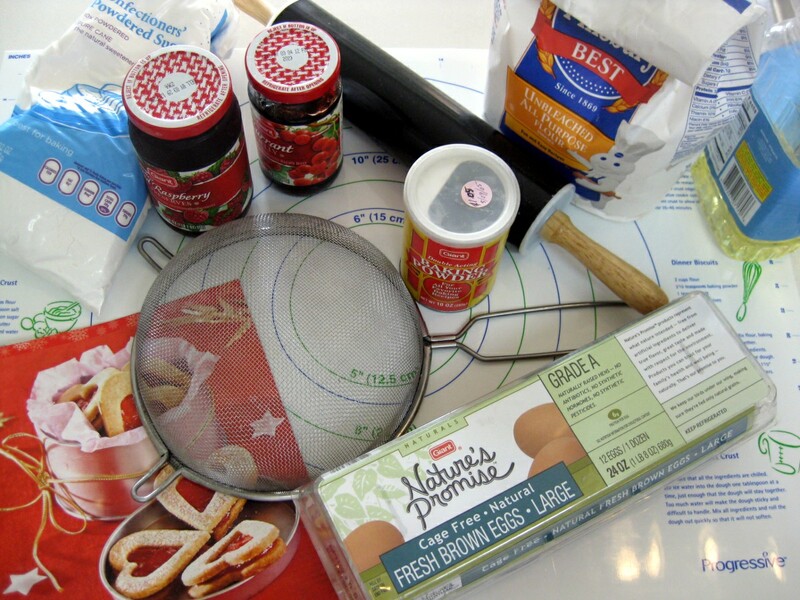 But enough said, let’s get baking! 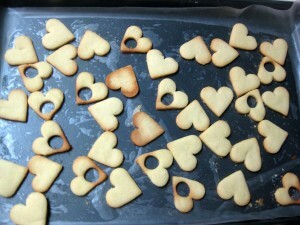 These cookies are actually quite easy to make. The ingredients below are from the recipe, we ended up using half the amount. Ingredients for baking Slovak Christmas cookies. 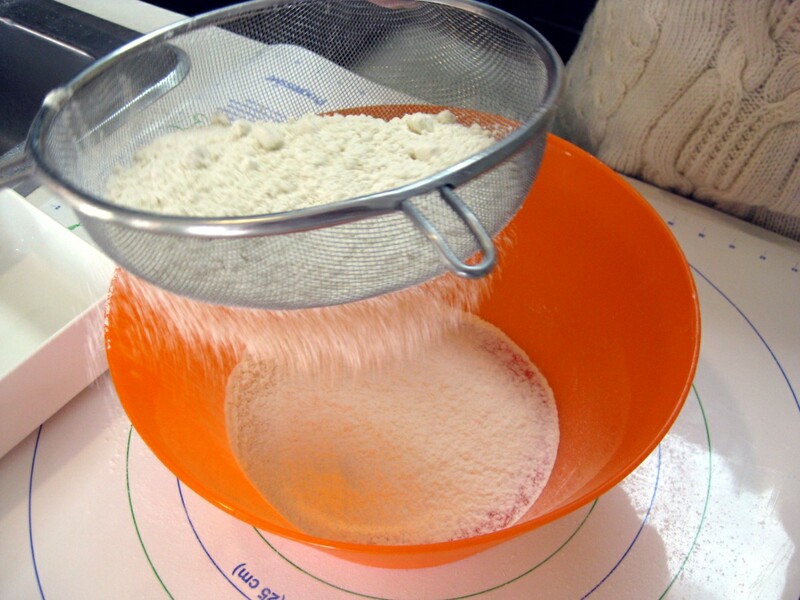 Start by sifting the flour. Sifting will make the flour more fluffy and less dense, and improve the texture of the cookies. 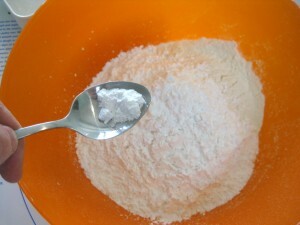 Add to a mixing bowl along with the sugar. By the way, even though I listed the volumes in the ingredients, its better to use a kitchen scale to actually weigh the ingredients. 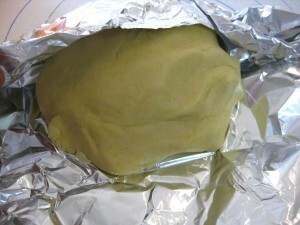 Then add the baking powder and margarine. Add the eggs and that’s it. 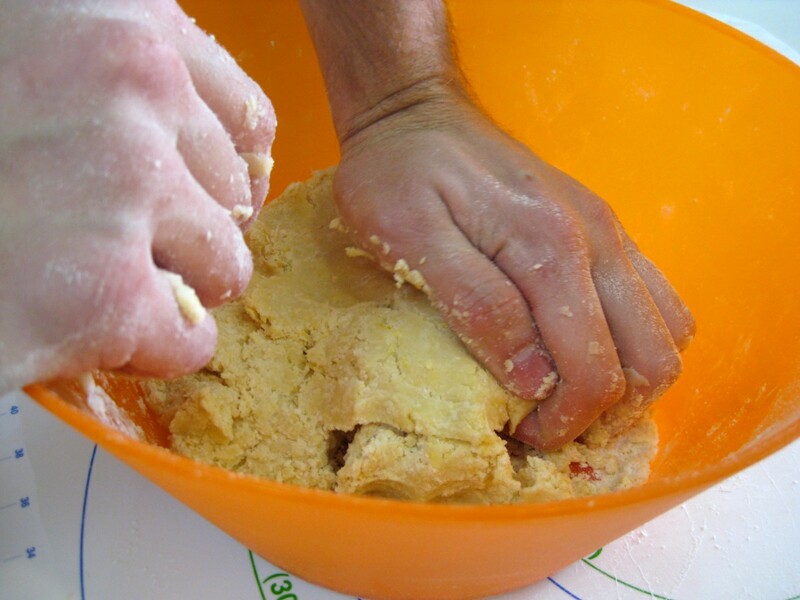 Then just knead the dough until you get smooth texture. Form into a ball, wrap in foil, and place in the fridge for about 30 minutes to let cool down (this will re-solidify the margarine). 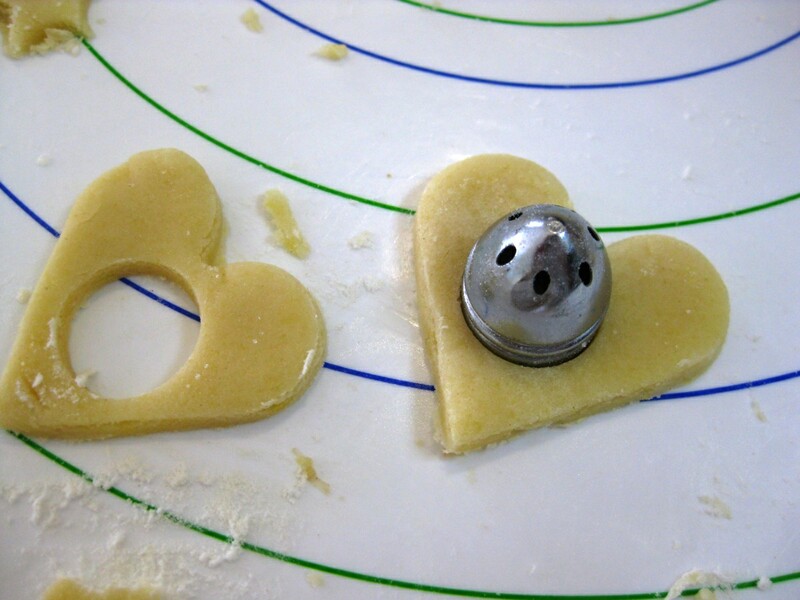 Then carefully roll the dough out on a floured mat, and use cookie cutters to cut out shapes – hearts ideally, since that is the name of this cookie. 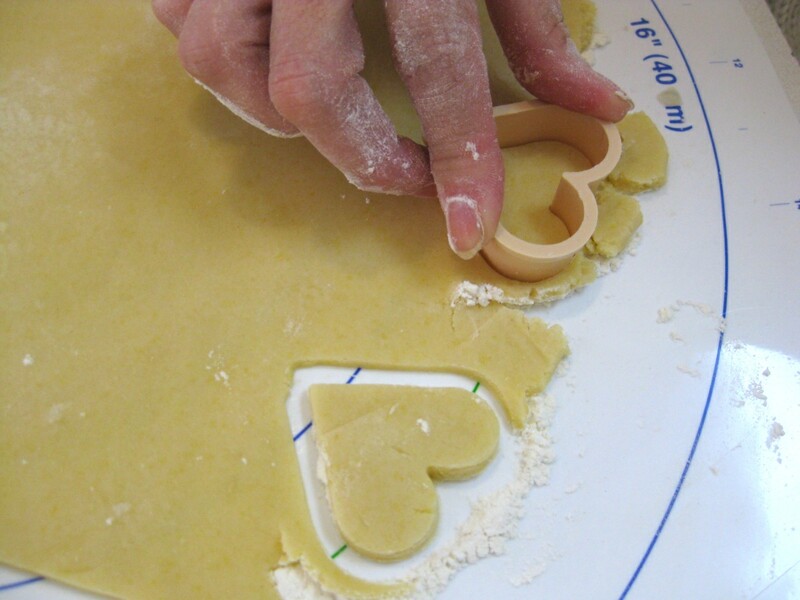 When cutting the shapes, it helps to give the cutter a little twist as you push down, if you get lucky, the cut out dough will come out with the cutter. 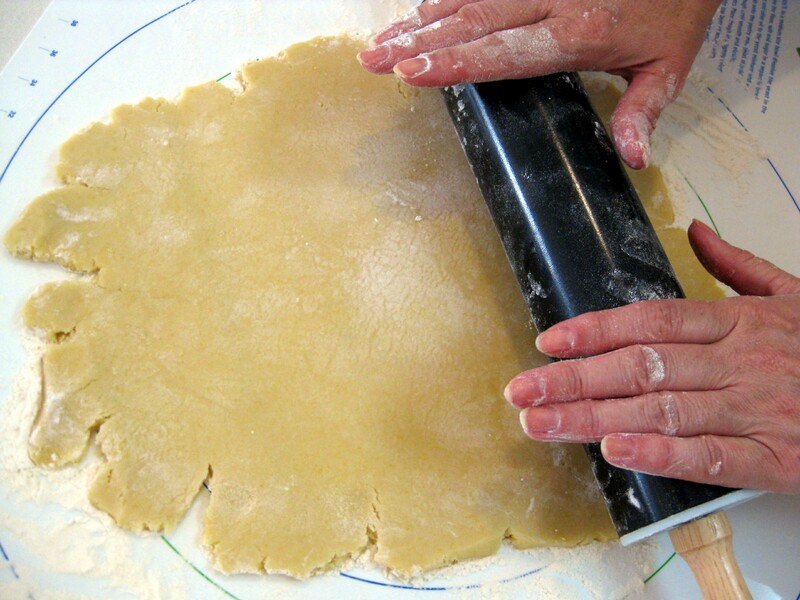 After you cut out as many shapes as possible, take the remaining dough, form it into a ball, and roll out again. Continue until all the dough is used up. You next need to cut out central circles in half of the cookies. If you have dedicated circular cutters, great! If not, look around the house, you may find something that will work. Such as this lid to a salt shaker. Place on a baking paper and bake for about 12 minutes at 350F, until the tops start getting slightly brown. But you don’t have to make just hearts. We also made few Christmas trees and some circles. Small drinking glass or a lid to a spice jar works well for cutting the circles. 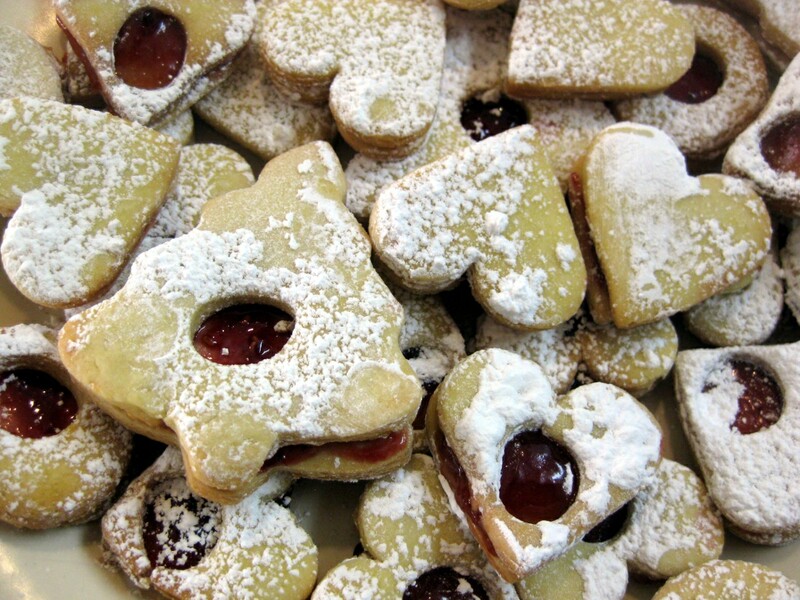 Spread jam or preservers on the solid halves after the cookies cool off. 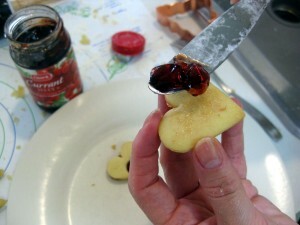 The recipe called for strawberry jam but we ended up using red currants. Red currants have a tangy, slightly sour taste that nicely balances the sweet cookies. Top with the perforated half. 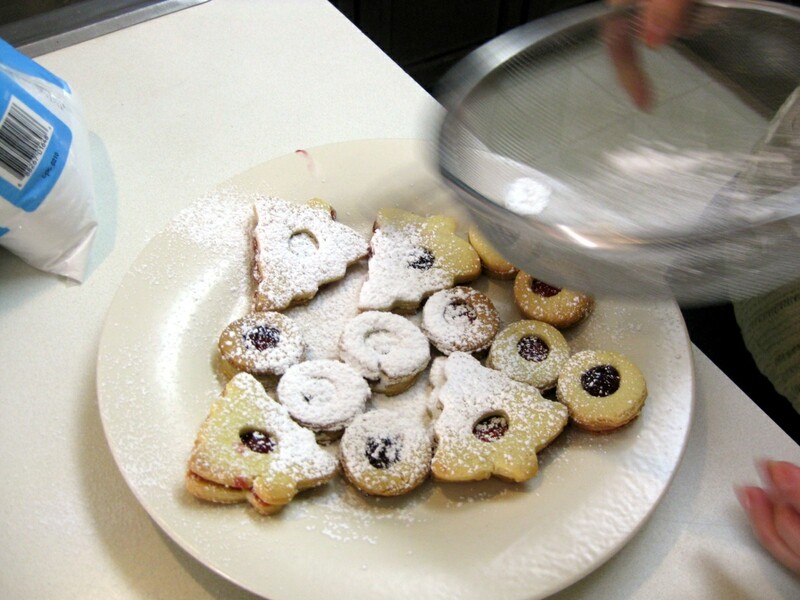 Then sprinkle with powdered sugar and eat. Or save till Christmas if you can resist. Don’t forget to check out Parts 2 and 3, striped zebra cookies and sugar rings. U nás naprv posypeme cukrom perforované polovice a až potom spájame džemom. Džem krajšie vynikne, ak nie je posypaný cukrom. Ano, super napad! Dakujem, nabuduce ich spravim tak. I know these kookies !! Moja maminka ich delala. Thanks for the recipe, my mother kept hers in her creative imagination !! I lreally like that u have included so many pictures in your recipe.These look so good and neatly done.Thanks for stopping by on my blog. 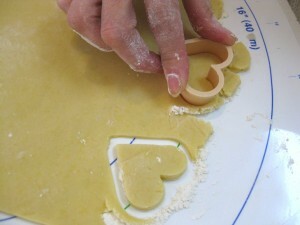 These cookies are also a BIG hit on Valentine’s Day or for a bridal shower. Using the vibrant red currant jelly (Crosse & Blackwell) and white confectionary sugar is so beautiful & delicious. I recommend using currant jelly for the appealing bright red color. Do you know of a receipe that uses vanilla icream in the dough cut into squares jam placed inthe center and folded over corners pinched inthe center? Sort of looks like a Kolacky. Hi Janice, sorry, don’t know that one. Does the ice cream melt away? i just doubled the margarine, and it turned out perfect, thanks! Glad to hear that! The dough for these cookies should be rather dry though. 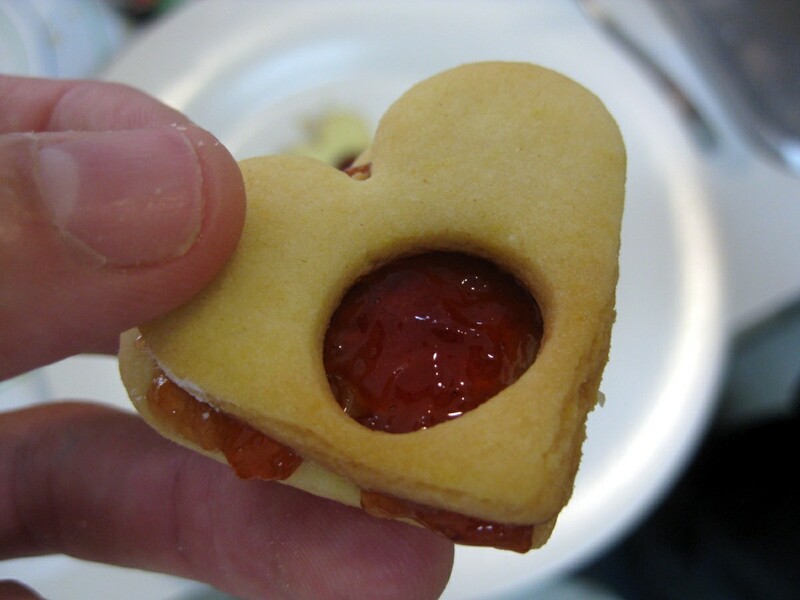 It’s definitely not the elastic kind you may be familiar with from making bread, etc..
Can these cookies be frozen and then add the jam and icing as you serve so you can make them ahead of time? 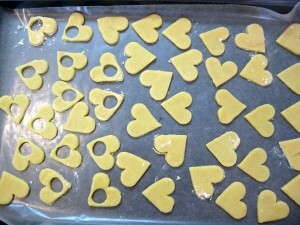 My children 4&6 ‘helped’ make the cookies and really enjoyed it. I added Vanillia sugar in addition which gave it a nice underlying flavour. 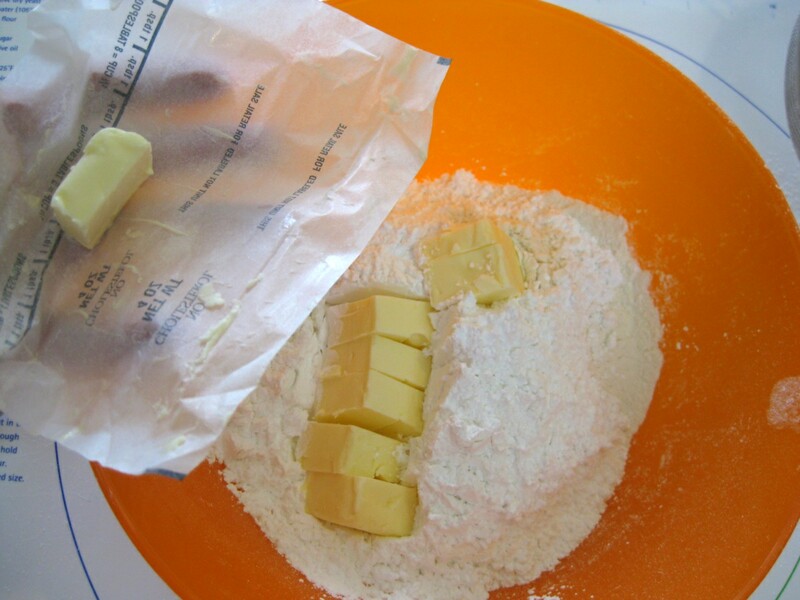 Can I use butter instead of margarine? Thx!